The 5mp indoor dome cameras from bosch are professional surveillance cameras that provide high quality mp images for demanding security and surveillance network requirements. 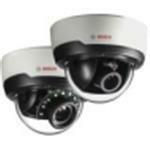 these domes are true day/night cameras offering excellent performance day or night. the avf (automatic varifocal) feature means that the zoom can be changed without opening the camera. the automatic motorized zoom/focus adjustment with 1:1 pixel mapping ensures the camera is always accurately focused. the built-in video analysis reinforces the intelligence- at-the-edge concept and now delivers even more powerful features. essential video analytics is ideal for use in controlled environments with limited detection ranges. the system reliably detects, tracks, and analyzes objects, and alerts you when predefined alarms are triggered. a smart set of alarm rules makes complex tasks easy and reduces false alarms to a minimum. metadata is attached to your video to add sense and structure. this enables you to quickly retrieve the relevant images from hours of stored video. metadata can also be used to deliver irrefutable forensic evidence or to optimize business processes based on people counting or crowd density information.